I'm so excited to finally be able to show this quilt to you! 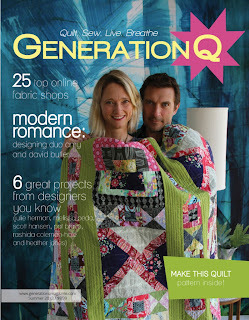 This is my you + me quilt, which I designed and made for the first issue of GenerationQ Magazine. Instructions and the pattern for you + me is in the magazine, and I must say we are in pretty good company. Just check out the cover. And I've got an extra copy to share with one of my readers, so keep reading to find out how you can win it! I was so honored when my friend Scott Hansen asked me to design something for their inaugural issue last fall. He had originally asked for it to be made in other colors, but as the magazine got closer to print, Scott asked me if I could make the quilt in orange, navy, and white. It was a bit of a stretch for me to do that because those are not normally my "go to" colors, but I was excited to challenge myself with the design. I started by drawing the design, to scale, in my sketchbook like I always do with my patterns. When I sketch out designs, I use these Pitt markers by Faber-Castell. I really love them because they have such great, bright colors, and the brush tips make filling in large sections of color really easy, but they are also tapered enough to allow for smaller, detailed work. This was the first mock up that I finished. I liked it, but I felt like the blue was a bit overpowering, so I drew it again, and changed the layout of the colors. I liked this version better, so this is how I made the final quilt. The fabrics I used are all Kona solids by Robert Kaufman, who generously donated everything to me for the project. The orange is their Tangerine, the blue is Windsor, and the white is Snow. There was such a tight deadline with this project, so as soon as I received the fabrics from Robert Kaufman, I went to work. I took a few shots of it in progress on my design wall. It was really fun to see it come together and compare it to my design in my sketchbook. For the back, I used some bits and pieces of leftover fabric and improvised their placement, surrounded by lots of Kona Snow. As soon as the quilt top and back were finished, they went off to the amazing Angela Walters to be quilted. She worked her magic with lighting speed, and sent the quilt back to me in record time. I quickly finished the binding, and you + me went with me to my taping of Quilting Arts TV in early March. If you look closely at the photo above, you can see it folded on the table to the right. And then it was off to Jake Finch, publisher extraordinaire of GenerationQ, in California to be photographed for the magazine. I'm telling you, it was a whirlwind! It was so great to finally see the quilt again at the GenerationQ booth at Quilt Market last week, and I can't wait to get some more photos of it myself, so I can show you more of Angela's amazing quilting. And now for the giveaway...The pattern for you + me is in the first issue of GenerationQ magazine, which you'll be able to buy from their website and selected retailers very soon. But, I picked up an extra copy to giveaway to one of my readers at Quilt Market. To enter, leave a comment on this post letting me know what colors you would make you + me in. Would you use solids or would you use printed fabrics? Please be sure that your email address is either in the comment or connected to your blogger profile so I can contact you if you are the winner. I'll use the random number generator to choose one winner and the giveaway will be open until Tuesday June 5 at midnight ET. International entries are welcome! Good luck!! I love the colours you used! I don't think I'd change a thing! I think i'd like to try the pattern in snow, peony and old green...although, yours is lovely!! I would need to experiment with some sketches to decide for sure, but right off the bat I am thinking that a light grey, dark grey, and smokey lavender would be fun -- it wouldn't have all of the great contrast your quilt has, so it would be quite different, but I think I would like it! If I made the You + Me quilt, I would do it with a Christmas theme. I would use Christmas red and green and white. In the white spaces, I would embroider in white the names of family members I spend Christmas with and words which evoke Christmas memories. I enjoy reading your blogs of your success in the "new" world of quilting. I really like the colors you used. I would probably stick with solids. I'd definitely stick with solids for the quilt, but probably use a print for the back. I don't know what colors I would use...royal blue and chartreuse maybe. Because I live in the "BIG BLUE NATION" (Lexington KY), I would use a patterned Univ of Kentucky for the blue, white and then a solid blue. orange and purple are my favorite colors together right now. and i might do the background fabric in a light orange/almost yellow. it might also be neat to do this quilt in tonals, shades of grey maybe? I would do a rainbow of color. I think your blue in black and the orange in several different colors. Thats how I would do it. Green and purple.Thanks for the giveaway. I think I would use a gray and a steely green for a wall-hanging for my bedroom. Love your pattern and would love to win a copy of the magazine! Thanks and congrats! Heather, I would use red in place of the orange and maybe use a brighter blue. I must have Memorial Day on the brain. I would use solids. I live the orange and navy even though they aren't really my colors either. I think the pattern would look great in red, white and blue - a modern take on the patriotic quilt. I love this! I'd try burnt orange with celadon on a gray background. Oh wow - so many possibilities!! Love crisp white navy and lime green...or white grey and purple... or red white and fushia pink :) Great giveaway - thanks for the chance! HELLO! I LOVE THIS-I'D USE RED AND CREAM! THANKS FOR SHARING! The solids add so much to this design. I would keep going with that idea and make it in teal and chartreuse on an ash background. Thanks for the chance! I would substitute charcoal for your blue but leave the others as is, thanks for the chance! I would use solids. Cheddar background, green and orange. Thanks for the chance to win. I think this would make a great patriotic quilt in red, white, and blue -- but would also like to see it in gray, sky blue, and yellow. It's a wonderful design! I love your quilt! Congrats on the publication. At first glance, I thought red, white & blue. I would use a blue solid or blue on blue print for the contrast, and lots of different red & white prints for the main color. Of course, white for the sashing and borders. great quilt and hope I can find the magazine around here. I would use a print and a solid. My in red and aqua. I would use the college colors of Virginia Tech where my husband, son and I all went -- orange and maroon. I might use prints and either a white or ash background. I might also do one in black & gold as we are Steeler fans. Red and white would be rally cool may with a hit of turquoise! I'd definitely go with a grey background...not sure about the colors yet, but maybe with a print? Such a great pattern! Congrats!! I think it would be really pretty in some browns, blues, and pinks. Thanks for the chance to win! My first choice would be to make one exactly like yours--John loves orange with blue and would be thrilled. But if I were to make an alternate version, I think I'd use charcoal in place of blue and a deep red in place of the orange. Such a versatile pattern. Quite an honor to be included in GenQ Magazine; at the same time, I think they're lucky to have you. I love your colors, but as I'm not an orange person, I might change it to chocolate, tan, and a lighter blue. I'd choose different shades of green! And probably a mix o solids and prints! Funny you would ask because I was just thinking that I would have tried prints. Thanks for the giveaway! I lovfollies, so I might do an aqua and navy quilt. Or aqua and grey. I think the lines would look great with prints and a bold solid, but all solids are beautiful too! Delete this is it screws up the giveaway! My comment should have read "I love blues." I would love to use shot cottons. And I think I would use grey, light blue and white. I would definitely do a solid quilt with snow, gray, and yellow. Maybe. I'd go with solids -- red, white & blue. It would make a great Independence Day quilt! I really love your version with the orange, navy and white.. it's beautiful! Cream background with teal and purple. I think I would use solids in the same colors you used. Thanks for the chance to win a copy of the magazine. I'm pretty sure I'd use prints to make this. I know it will sound strange when I say that solids scare the daylights out of me. I have no clue why but they do. lol Some day I'll just bite the bullet, step out of my box and make a solids quilt. Wow! This quilt is so beautiful & I love seeing the process photos, it's so interesting to see a project from start to finish. I'd love to make this quilt in solids, probably Kona White, Coal & Chartreuse. Thanks for the chance to win a copy of this fantastic magazine. I love your quilt. I might try it with grey and yellow- a really, really rich yellow print- maybe. It's use white as the main color & then yellow & green. But there are some great ideas in these comments! I'd use the colors of a bride's wedding - say brown & pink or black & red - really nice, Heather!!! Love those colors together, beautiful work Heather! Would love to see what it would look like in greens/blues with a pop of strong pink! Wow! I love this design, so striking. This would be a perfect "boy" quilt in my mind. I like the navy, orange and white. I think it would also be nice in chocolate brown, aqua and white/cream. Your quilt turner out great and I do love the colors! I think I would make it in yellow, a lime green and turquoise. I love these colors. Orange is one of my favorites. I would probably replace the white with lime green and the blue with purple. All in solids. I don't think this is a pattern that lends itself to prints very well unless is was very small dots. LOVE LOVE the design!!! I would or I should say will more than likely make this for my son!! Perfect to go with a nautical theme and I would make it in Blue and Green!! You must be very excited. I like the clean lines of "you+me". I think I'd like to do a green, limey-green I think, and purple (I can't believe I said that since I'm not a huge purple fan) and white. All solids are so nice; I'd pick that. I think that would make a striking quilt. Your colors are striking as well. Thanks for this opportunity. I'm planning to do my son's nursery in blue and orange, so I wouldn't change much with this quilt. I think the only thing I'd do different would be to use an aqua blue instead of navy. I would use yellow, grey and white. Or Blue, yellow and white. Or Black, red and white. And I do like the orange! I just love the pattern and I hope I win! Honestly I like it the way it is. THe colors you have are pretty much everything I have around my home and my blog. I might go a bit farther an add a yellow. Or do a scarlett and grey since this quilt has a great sporty vive to it. I think it would look quite striking in citron and grey. I think this would be pretty in red, white, and blue for 4th of July. Very nice pattern Heather! This pattern for me to try would be in a medium gray background, lime green stripes and white. I would love to make it with grey and citron yellow solids. I am loving tangerine these days, and though it wouldn't have the lovely contrast that yours does, I might pair it with aqua. Love, love, love it! I wouldn't change a thing! I NEED this pattern! Wow, I love you + me! I probably would make it in solids as well, but some darker guy option with coal as background and a limegreen and dk blue. Oh, this makes me want to break out my coloring supplies! Right now, I'd use solids, a medium grey for the background, a dark blue(navy?) in place of the orange, and pale yellow instead of the dark blue. I think it'll look like the sun coming out after a storm. I love seeing your design process. I'm thinking ombre colors would suit this pattern well. Love seeing how you designed this. I would like to make a you + me in sage and light tan with white...it would look wonderful hanging in my stairwell. I'd love to do you + me in Kona Coal, FS Solids in Violet and Pomegranate.